Do Rear Vision Cameras for Trucks Really Make a Difference? In Most case with Trucks, Buses and Heavy Machinery, the Driver or Operator cannot see directly behind the vehicle. With our Rear Vision systems which are powered up when the engine is running, allows the Driver/Operator to see what or who is behind them at all times, which helps in situations such as changing lanes. Many public bus companies have adopted the use of Rear Vision Cameras as a standard for their entire fleets. Rear Vision Camera Systems for Heavy Vehicles has increased in demand recently due to new Industry Safety Guidelines which have been introduced. 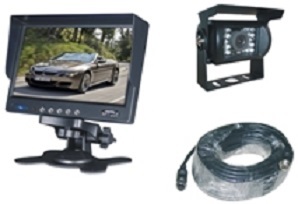 We have a range of Heavy Duty high quality and reasonably priced Reverse Camera Systems and Rear Vision Camera Systems to suit all types of trucks/Trailers, Buses, Earth moving and Heavy Machinery. The JS005K is a basic Reverse Camera System which comes with an adjustable Dash mount bracket that holds a 5" Colour LCD Display. 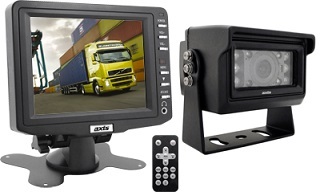 The smaller screen is suited for small machinery, small trucks and vans, or where only 1 camera is needed. CAMERA - Viewing Angle:120 • TV Lines:480 • Image: Mirror Image • Signal System: PAL • Image Device:1/3 Sony CCD • Image Orientation:Mirror • Night Vision: 10 LED • Ingress Protection: IP68 • Illumination: 0.1 Lux with IR on. The JS055CK is a Dual Reverse Camera System which comes with an adjustable Dash mount bracket that holds a 5" Colour LCD Display and a heavy duty trailer quick connect cable Designed to suit Most truck and trailer setups or any situation similar, these are a robust and heavy duty design which can withstand the elements. 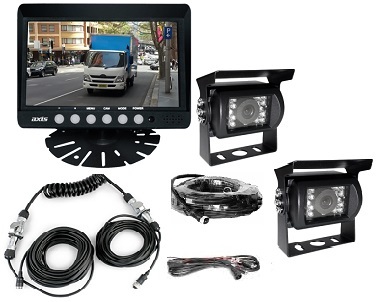 The RDK7H is a well priced and is suited for all trucks with options to run a 2nd camera for a Truck/Trailer combination (additional parts needed), this system comes with a 7" Colour LCD/LED backlit Screen and the Heavy Duty Night Vision Camera. 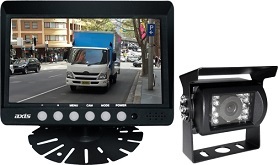 The JS022K is a popular model and is suited for all trucks with options to run a 2nd camera for a Truck/Trailer combination (additional parts needed), this system comes with a 7" Colour LCD/LED Screen and the CA10/CCD Night Vision Camera, offering proven reliability and superior quality. CAMERA - Viewing Angle: 120 • TV Lines: 420 • Picture Resolution: 582 x 500 Pixels • Waterproof Rating: IP67 • Image Device:1/3 Sony CCD • Image Orientation: Mirror • Night Vision: 18 LED • Ingress Protection:IP68 • Illumination:0.1 Lux with IR on. CAMERA - Viewing Angle:120 • TV Lines:480 • Image: Mirror Image • Signal System: PAL • Image Device:1/3 Sony CCD • Image Orientation:Mirror • Night Vision • Illumination: 0.1 Lux with IR on. • Power: 10-30V DC Input • Inputs: 1 x Camera. 1 x AV • Distance Guidelines • Trailer Quick Connect Cable with brackets. The JS022CK is a Dual Reverse Camera System which comes with an adjustable Dash mount bracket that holds a wide 7" Colour LCD Display and a heavy duty trailer quick connect cable Designed to suit all truck and trailer setups or any situation similar, these are a robust and heavy duty design which can withstand the elements. MONITOR - 178mm 7 Inch TFT Active Matrix LCD • LED Backlighting • Power Input: 12V - 24V • Aspect Ratio:16:9 Widescreen • Video System: Auto Pal/Ntsc • Resolution: 800 W X 480 H • Camera Inputs: 2 x 4-Pin • Viewing Angle: 70 x 70 x 60 x 70 • Built-In Parking Guidelines (can be disabled) • Trailer Quick Connect Cable with brackets. The Axis BA102 Reverse Squarker is the latest edition to our Safety Products range and is a requirement on all major civil construction contracts throughout Australia. 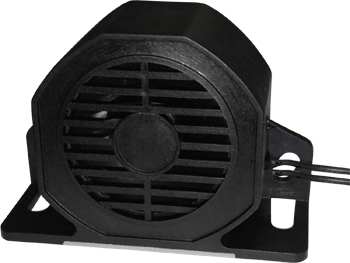 An inexpensive and reliable product suitable for 12V and 24V trucks.